How Not to design a hydraulic servo system. 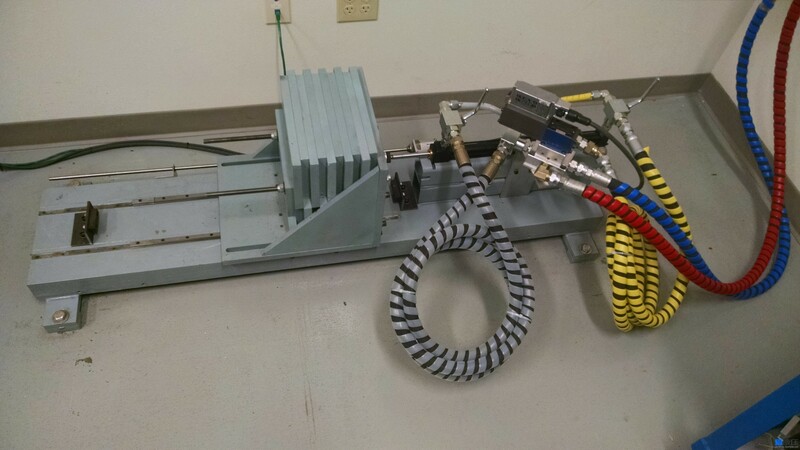 Over the summer we hired a college student to design a hydraulic system. The goal was to have a natural frequency less than 10 and a damping factor less than 0.5. The lower the the natrual frequency and damping factor the better. I wanted a system that would be extremely difficult if not impossible to optimize the closed loop gains for good motion using a PID with velocity and acceleration feed forward. The student met the goals. The end result is a system with a can of about 5 inches per second per volt when retracting and 5.7 inches per second per volt when extending. The natrual frequency is about 6.4 Hz and the damping factor about 0.15 which is extremely low. This hydraulic servo system is almost impossible to optimize controller gains unless the accelerations are very low. My Chinese is poor. I speak English. I write in English and use a computer to translate to Chinese. Then I use the computer to translate the Chinese back to English to see if the meaning changes. Sometimes the computer translation is poor. Sometimes it forgets to translate the word 'not'. This changes the meaning of what I am trying to say. What I really meant to say is written in English. In the past I had human translators from China to help correct the computer errors. Now I do not. The hydraulic system in the picture is for training students. The design is intentional. It is very difficult to control using trial and error. Is the low natural frequency of the system an intension of Mr. Pen? If the acceleration is 5m/s^2, how to find out the acceleration frequency? I have a video. I was waiting to add a Chinese translation. At first the system is moving back and forth. The control is very good because it uses our special algorithms. The customer does not need to know the algorithms because the gain optimization is easy. 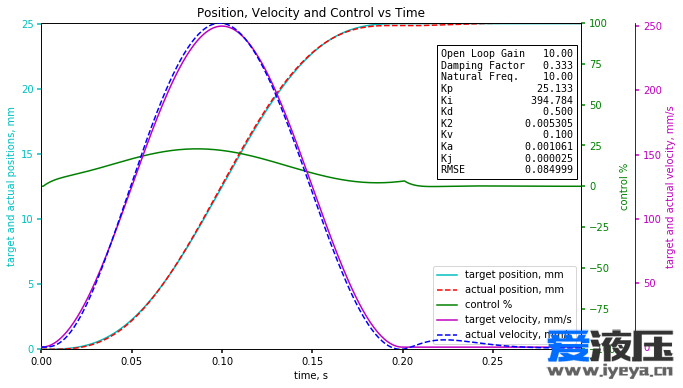 Then I try optimizing the controller gains for a standard PID with velocity and acceleration control. You can see this doesn't work well because the system is very underdamped and the natural frequency is low. When I try to move the load the frequency of acceleration is 5 Hz but the natural frequency is only about 6.5 Hz, not 4x5Hz=20Hz. A normal controller can not control this system well. Then I use the same data but use our advanced algorithms to optimize the controller gains. I can increase the controller gains and still be stable and control very well. YSX says there are complicated algorithms. Yes there are but they are in fimware. The user doesn't need to know them. YSX says it takes time to optimize the controller gains. You can see it takes only about a minute. The RMC motion controller is controlling a system with a frequency of acceleration to natural frequency of 6.5Hz/5Hz or about 1.3 to 1. This is much lower than 4 to 1 for a normal PID with velocity and acceleration feedforward. Digital hydraulic says theory only works on ideal systems. This is proof theory always works for those that know it. So what does this mean? To make the system better I would remove the hose and make the cylinder diameter 50mm instead of 25mm. However, this would reduce the top speed from 1 m/s to about 250 mm/s. This would slow production. The RMC controller will pay for itself with increased production. GMT+8, 2019-4-25 17:59 , Processed in 0.101965 second(s), 29 queries , MemCache On.